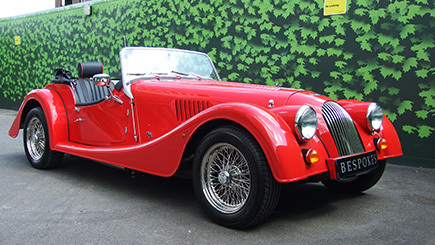 Fulfil your dream of taking the wheel of your very own sports car for a weekend, whether for your own pleasure or to cap that very special occasion when you want to be seen to arrive in style. Take the keys of either the sleek Lotus Elise 111R, the BMW Z4 Roadster (2.5 Litre), the Porsche Boxster or the Morgan Plus 4 and, with four days of weekend hire, you'll have plenty of time to enjoy your car of choice. All cars come with an allowance of 300 miles included and, although picking between these four beauties will be tough, there is no doubt the hardest part will be handing the keys back at the end of the weekend. Drivers 30 - 65 years only. Full manual driving licence, held for a minimum of two years required, with fewer than 6 points. A credit/debit card deposit of between £1,000 and £2,000 is required on collection. The car will be available for collection from 9am on Friday and must be returned by 4pm the following Monday. You will be charged a per mile rate if you exceed the allocated mileage for your vehicle.